By now, we would have established the fact that just like in the HBO series Game of Thrones, where different Houses lock horns for a variety of motives, corporate departments with diverse backgrounds, objectives and expertise may come in conflict with one another in more issues than one. Let’s take a look at the most common discussions between Marketing and Procurement. Marketing: I want high quality corporate giveaways for our VIP guests. Procurement: We can give them a pen. Marketing: Good, make it Montblanc. Procurement: OK then, we will look for suppliers in Asia who can manufacture a replica of Montblanc. Marketing: We need to produce a marketing collateral and point-of-purchase for our new high-end product. Procurement: OK then, we can deliver this in two months. Marketing: That’s too long. It’s only one piece of POP material and few collateral. Why two months? Procurement: We have to look for the cheapest suppliers who can provide you with cheap materials, done by cheap labor and supervised by untrained management? 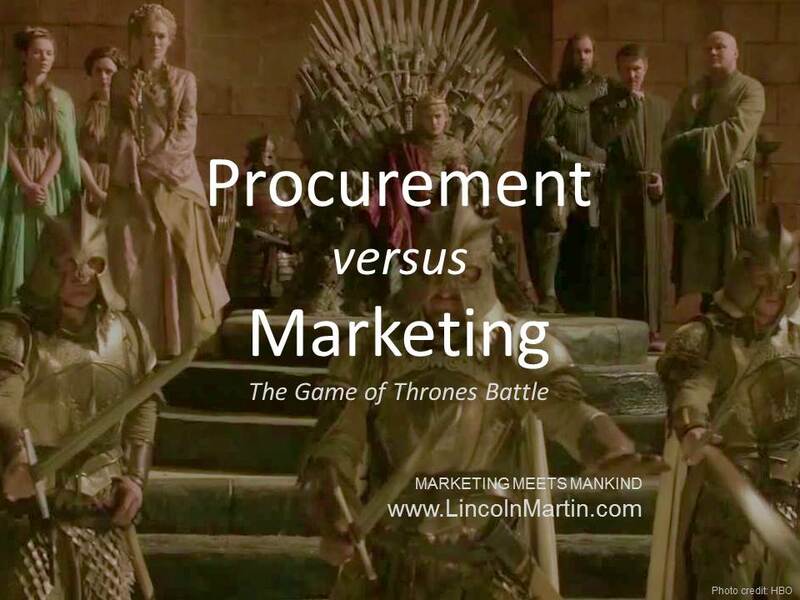 One of the most notorious contrasts in the corporate world is that between Marketing and Procurement. Thinking of it as the Starks against the Lannisters would give you are clearer idea of how pronounced the difference is between the two departments. The friction amid the two was all the more exacerbated by the recent economic downturn, which forced most companies to tighten their grip on their purse. Businesses know that Marketing is essential to fuel top line growth, but this is rendered meaningless unless Procurement checks it with the cost discipline equally important to the bottom line. The conflict usually arises when Procurement cannot identify a return for the investment in the activities of the Marketing department, while the latter will move mountains just to get the support that it desires. Be it a new website, online marketing campaign, viral corporate video for social media, brand activation or a major 360 advertising campaign, Marketing and Procurement oftentimes find themselves at odds with one another in trying to understand where each’s decisions and actions come from. Is it Mixing Oil with Water? With the added pressure of the need to thrive amidst the recent recession, companies may regard resolving the rivalry between Marketing and Procurement as impossible as mixing water with oil. With the intervention of the senior management and the introduction of new processes, however, it is possible for Marketing and Procurement to align themselves. For instance, the senior management should stress to both the departments that they have responsibilities to ensure that the supply chain is involved in more things than profits. Marketing in this case should take care of protecting the company’s brand, while procurement should implement sustainable, ethical and fair-trade practice with the supply chain. General Managers or Operations Directors should highlight the two departments’ similarities instead of their differences. A closer look would reveal that both Marketing and Procurement aim to deliver the best products at the most opportune time for the right prices but to different customers. Instead of focusing on where their objectives diverge, company executives should bring to light where they meet. 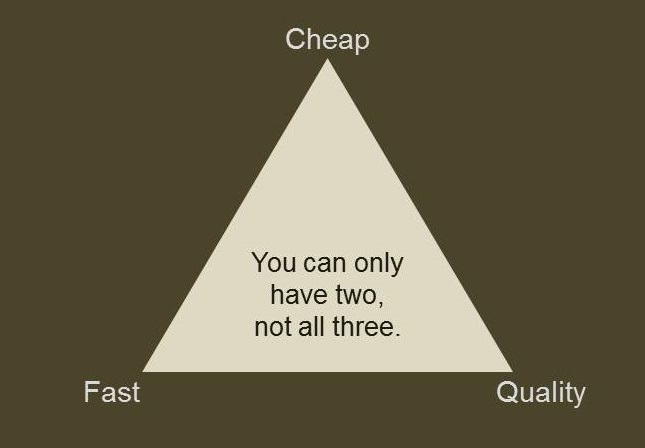 Most people want cheap, fast and high quality product. According to the famous urban management legend, you can only have two elements, but not all three. The pyramid shows that the Procurement department is bounded by only two elements, while the Marketing department wants all three. Quality + Fast = Does not come cheap (i.e. Procurement will hire more manpower, machines and tools. Therefore expenses goes up at the expense of Marketing). Cheap + Quality = Does not come fast (i.e. Production will take time since Procurement can’t hire additional manpower to speed up the process due to Marketing’s small budget). It is highly inevitable that Marketing and Procurement will closely work together in innumerable instances. The merit in resolving whatever issues they may have between each other lies in a unified supply chain – the kind that bridges customers through Marketing and suppliers through Procurement into one collaborative system.